Spectroil Series are easy to use, reliable and the workhorses of commercial and military oil analysis laboratories that require the rapid analysis of wear metals, contaminants and additives in lubricants. It measures trace quantities of elements dissolved or suspended as fine particles in natural or synthetic petroleum based products using the time-tested and reliable rotating disc electrode (RDE) technique. The Spectroil is the ideal spectrometer for the in-service oil analysis laboratory because technology has made it smaller and the addition of an innovative CCD optical system has made it more flexible for even the most exotic in-service oil analysis applications. The standard configuration is equipped and calibrated for 22 wear metals, contaminants and additives. Additional elements can be added at any time, even in the field and if your application suddenly calls for unusual elements such as niobium, lithium or rhodium. An external computer with current Windows software controls the system. The additional capability to analyze engine coolants is available as an option. The Spectro LNF Q200 series applies the world’s best oil particle counter technology. With an intuitive, configurable GUI and no calibration required, the Q200 series is fast, accurate and easy to use. Sample preparation is efficient with the LNF. Viscosities up to 320 cSt can be processed without dilution due to the wide dynamic range. And unlike conventional light blockage particle counters, there are no flow control valves that need adjusting when testing different sample viscosities. The advanced design makes it much more than just a particle counter: The LNF also calculates free water in ppm, and differentiates contaminants. Several models are available providing particle counts and codes, abnormal wear classification and ferrous wear measurement. Particle counts and codes per ISO 4406, NAS 1638, NAVAIR 01-1A-17, SAE AS 4059, GOST, STM D6786, HAL, and User defined bins. LNF Q200 directly images wear particle silhouettes, and counts and classifies wear particles over 20 microns as cutting wear, sliding wear, fatigue wear, nonmetallic or fibers. This allows operators to determine the type of wear debris, wear mode and potential source from internal machinery components. Ferrous wear measurement is a critical requirement for monitoring machine condition. The high sensitivity magnetometer measures and reports ferrous content in ppm/ml, and provides ferrous particle count and size distribution for large ferrous particles. The in-line design of the magnetometer with the LNF flow cell enables measurement of both ferrous content and total particle count on the same sample, eliminating the need to measure Ferrous content on another instrument. SpectroLNF- Q210: LNF Particle counter. SpectroLNF -Q220: LNF Particle counter with wear particle shape classifier. SpectroLNF- Q230: LNF Particle counter, automatic shape classifier, and ferrous monitoring with a magnetometer. T2FM Q500 Analytical Ferrography Laboratory is a complete analytical system for the separation and interpretation of wear and contaminant particles in used lubricant oils, hydraulic fluids, coolants and fuels. It consists of the T2FM Ferrogram maker, a bichromatic microscope, video camera and image capture software. The SpectroT2FM Q500 is fast because there is no delay time as sample is pumped through plastic tubing before reaching the ferrogram surface. The T2FM delivers the entire sample and all the particles contained therein onto the ferrogram surface. A crystal clear rinse is obtained without fail for every ferrogram. There are no last minute drips of oil sample onto the ferrogram leaving distracting halos around the particles when viewed under the microscope. A bichromatic microscope is used to view and examine ferrograms made with the SpectroT2FM Q500. The bichromatic microscope is equipped with both reflected (red) and transmitted (green) light sources so that the ferrogram may be illuminated from both above and below the microscope stage. With bichromatic illumination, metal particles, which reflect light, appear bright red, whereas nonmetallic particles appear green because light transmits through them. A video camera connected to a computer displays, prints, stores and retrieves ferrographic images. Comparison of old ferrograms with ferrograms from recent lubricating oil samples allows determination of evolving wear modes inside a machine or engine. ASTM D7684 - "Standard Guide for Microscopic Characterization of Particles from In-Service Lubricants"
ASTM D7690 -"Standard Practice for Microscopic Characterization of Particles from In-Service Lubricants by Analytical Ferrography"
Ferrography assists in the diagnosis of the origin, characteristics and distribution of wear particle debris. Separates particles up to 800 µm in size. The FluidScan® Q1100 provides direct quantitative measurement of a lubricant’s condition and plays an important role in Machine Condition Monitoring (MCM) for proactive and predictive maintenance in Reliability Management programs. It determines when oil needs to be serviced due to degradation of the oil chemistry or contamination by other fluids such as water or the wrong oil. The FluidScan now includes an innovative test methodology for both dissolved and free water, a practical alternative to more complex tests such as Karl Fischer titrations. The FluidScan correlates to TAN and TBN measurements made with the ASTM D664 and D4739 titration methods. The device software displays interpreted test results, including oil health determination. Data can be exported to companion software, including the AMS OilView LIMS module. It also fulfills the National Emission Standards for Hazardous Air Pollutants for Reciprocating Internal Combustion Engines (NESHAP RICE) requirements for extending oil change intervals in engines and back-up generators when used in conjunction with the Spectro Q3050 Portable Viscometer. The portable Q1100, when used in conjunction with OilView software, enables route based oil analysis, which integrates with other widely used predictive maintenance technologies such as vibration and thermography. The Q1100 plays an important role in predictive maintenance and Machinery Health™ management by measuring water, total acid number (TAN), oil oxidation, glycol, total base number (TBN) and other parameters. In addition, the unit’s patented flip-top design speeds test preparation and cleanup. The route-based capability of the FluidScan® Q1100’s operation allows the device to virtually eliminate mislabeled samples and long wait times for laboratory analysis. Furthermore, results highly correlate to TAN and TBN laboratory tests conducted with ASTM D664 and D4739 titration methods and water tests with the ASTM D6304 Karl Fischer Titration Method. Generate sampling routes for walkaround oil analysis using AMS OilViewTM software. Results for critical properties such as TAN, Oxidation and water contaminationfor industrial lubricants and TBN, water, oxidation, nitration, sulfation, glycol and soot for engine oils. With three simple test, the MiniLab 53 delivers comprehensive on-site oil analysis, providing immediate actionable results, saving time and reducing costs. The Minilab 53 uses the AMS OilView LIMS module to operate the MiniLab. The OilView software includes an Asset Management database and a reference oil database which can be expanded by the end user. The MicroLab 40 is a fully automated oil analyzer that provides diagnostic analysis of engine, generator, gear box, hydraulics, power steering, and transmission fluids. The MicroLab, originally developed by On-Site Analysis, has an embedded expert system which translates all of the analytical data into maintenance actions specific to your equipment. The artificial intelligence of the system is built from over 20 years of industry knowledge and more than 10,000 rules statements to generate the diagnostic statements that are specific to each application, the type of equipment and the type of oil. MicroLab 30 – Provides automated comprehensive diagnostic analysis of engine, generator, gear box, power steering, and transmission fluids. MicroLab 40 – Provides automated comprehensive diagnostic analysis of engine, generator, gear box, hydraulics, power steering, and transmission fluids. Recommended if particle count is needed for hydraulics. Cooling systems play a vital role in preserving the overall engine heat balance and in protecting engine components against corrosion and other problems. Machinery Lubrication magazine estimates that 60% of engine downtime in the commercial sector is cooling system related. CoolCheck provides automated measurement and profiling of coolant condition and diesel exhaust fluids integrity. The analyzer employs both NIR and UV spectrometers to determine the health of your coolant system. Fuel dilution in lubrication oil can cause serious engine damage. In diesel engine crankcases, for example, contamination can be caused by excessive idling, defective injectors and loose connections. Fuel dilution can also cause intercooler leakage in aircraft hydraulic systems. The Q6000 Fuel Dilution Meter (FDM) is a portable fuel dilution meter that can be used in the laboratory or in the field to provide rapid and accurate measurements of fuel contamination in engine oil. The Q6000 was designed with a patent-protected sampling method using an innovative “fang” design. The sampling occurs using a headspace system with repeatability of <+5 percent RSD up to 15 percent fuel content. The headspace vapor sampling approach also eliminates the need to heat fuel-laden samples and does not require the use of solvents. Developed in collaboration with the U.S. Navy, the Q6000 detects contamination in less than two minutes, allowing operators to make immediate decisions. The device requires just a small sample size in a disposable vial. The analysis results are displayed in percent fuel so operators can make rapid decisions about maintenance actions. In addition, the intuitive touchscreen and audio prompts guide the operator through the testing process. MINIFLASH TOUCH is a uniquely designed flash point tester for the determination of flashpoints of liquids and solids, using the Grabner flash point detection method of measuring the instantaneous pressure increase inside the continuously closed chamber, triggered by an energy-controlled electric arc. Heating the test chamber from the top avoids condensation of high volatile compounds, significantly improving the test results. Its continuously closed cup design and small sample volume of only 1-2 mL offers maximum safety, avoids offensive fumes in the testing area and reduces sample waste. The fast thermoelectric cooling at the end of a test and the fast and easy handling of the instrument save expensive labor time. The full color touch-screen of the MINIFLASH TOUCH runs on Microsoft® Windows® software and features an intuitive menu navigation that requires no training for flashpoint testing. Along with its convenient touch screen design, the MINIFLASH TOUCH offers an extended temperature range from 0 to 400°C, hassle-free communication with USB, Ethernet, LIMS and PCs and nearly unlimited storage capacity for programs and results. MINIFLASH determines the flash point according to ASTM D6450 and according to the advanced ASTM D7094 standard. This procedure describes the “Standard Test Method for Flash Point by Modified Continuously Closed Cup (MCCCFP)”, which offers the highest repeatability and reproducibility and an excellent correlation to the D93 Pensky-Martens method: “There is no statistically significant bias observed between ASTM D7094 and ASTM D93 Procedure A” as concluded during the last Round Robin. Furthermore, test results are equivalent to other well known standards such as Abel and TAG, and thanks to its unique design MINIFLASH can be used for more difficult applications such as flash-point testing of contaminated samples like diesel fuel in lube oil or gasoline in diesel fuel and for biodiesel testing. The new MINIFLASH TOUCH analyzer also includes improved methods for simulation of EN ISO 3679 and EN ISO 3680. Due to true portability and rugged housing, the MINIFLASH TOUCH is also the perfect solution for mobile labs and military applications. With over 3,500 oil and grease monitors in world-wide use today, InfraCal 2 Analyzers, originally developed by Wilks, have become a standard for the petrochemical industry. These essential tools ensure that oil content levels are below the regulated limit in water, drill cuttings, and soil. Both the InfraCal 2 TRANS-SP and InfraCal 2 ATR-SP are recommended for measuring oil in water, TPH in soil or FOG in wastewater. The new InfraCal 2, the latest introduction to our easy to use analyzers, uses the same measurement technology as our InfraCal TOG/TPH Analyzers with added features such as data storage and transfer, multiple calibrations and password protection for instrument settings. The InfraCal Analyzers are stand-alone fixed filter infrared instruments that give results that are comparable to EPA 1664 and ISO 9377-2 and comply with ASTM D7066, EPA 413.2 and 418.1. Applications: Hydraulic oil, In-Service oil, Formulated oil, Base stock, Additives, Glycol, Fuel, Liquid petroleum and related product. Applications: Suitable for liquid asphalts (bitumens), road oils and distillation residue of liquid asphalts at 60°C and asphalt cements at 135°C. MINIVAP VP Vision measures gasoline, jet fuel, crude oil, LPG and solvents. The analyzer provides a wide pressure range of 0 – 2000 kPa, without compromising precision. Long-term testing has demonstrated an unmatched repeatability of less than 0.2 kPa. The newly developed Grabner 2D-Correction™ (273 points) and exact piston positioning guarantee that accurate and precise results are received over the full measuring range. MINIVAP VP Vision incorporates Grabner´s Sampling Pro™ valve design, which during ruggedness tests proved to be the best-in- class piston based design for minimizing cross contamination between various sample types. The model MINIVAP VPL Vision was developed to automate the manual ASTM D2879 Standard Test Method for Vapor Pressure by Isoteniscope for low volatile samples, which is used by the chemical industry. The instrument incorporates a direct and an extrapolated “VOC” method for absolute vapor pressure measurement of single- and multi-component samples. The direct “VOC”-method is a static method for determining the absolute vapor pressure required for safety data sheets. The indirect method additionally allows to extrapolate to extremely low pressures or to temperatures that exceed the instruments temperature range (-100°C to +300°C). Both methods yield results comparable to the static ASTM D2879 Isoteniscope method, but do not require sample evacuation prior to testing. Based on the GRABNER Triple Expansion Method, air/gases are removed automatically from the measurement result and the sample composition is maintained during measurements. “VOC”-methods are available in both the MINIVAP VPL and the VP Vision analyzer. Because of a better sensitivity for low volatile samples, the precision of the VPL Vision is significantly better in the pressure range of 0.1 to 30 kPa. compounds. MINIVAP is the world wide standard instrument that is used by all major refineries, oil and pipeline companies, independent laboratories and car manufacturers. The US-EPA declared MINIVAP as the official reference instrument for the USA. MINIVAP VPS/H are stand-alone units that do not require any accessories. The unique piston based design for automatic sample introduction and volume expansion of the measuring cell makes an expensive and bulky vacuum pump unnecessary. The Grabner measuring principle in combination with the latest standards ASTM D6377 (for Crude Oil) and ASTM D6378 (for Gasoline) avoids tedious sample chilling and air saturation. This new technology significantly increasesrefinery profits: it reduces expensive labor time, eliminates operator bias and has considerably improved test precision that offers the advantage to blend closer to the limits and avoid product give-away. MINIVAP VPS is mostly used for QC purposes while VPXpert and VPSH offer even more features for crude oil and R&D applications, like volatility studies at elevated temperatures and at very low vapor/liquid ratios. Friendly and robust titrator combined with the latest touch screen/swipe technology. Improved productivity and operational efficiency thanks to simple design features. Pre-programmed methods for TAN/TBN, H2S, Mercaptan Sulphur, Saponification Number, Iodine Value in Petroluem products and Organic Chlorides in Crude oils. Ability to have updates including new applications/methods sent via email and up loaded via USB. Ability to perform ANY type of titration. NEW option- automated systems for TAN/TBN with analysis ranging from 12, 48 to 96 vessels; similtaneous test both TAN and TBN on 1 unit, with 1 autosampler. Accuracy: ± 0.1 mV (± 0.0016 pH). The MINISCAN IRXpert is the first completely portable multi-fuel analyzer for Gasoline, Diesel, Jet Fuel and Biofuel Blends, which uses the advantages of full spectrum information and full spectrum comparison to achieve utmost measurement accuracy. More than 100 fuel parameters are accurately determined by scanning the complete spectrum with superior resolution. Based on Grabner Instruments profound knowledge in fuel analysis, the MINISCAN IRXpert is designed as an intelligent, self-learning analyzer. The MINISCAN IRXpert is a completely temperature regulated, robust and user friendly spectrometer for the automatic measurement of concentration of the most important components of gasoline and diesel. Advanced chemometrics, a worldwide database of calibration samples and information derived from the complete spectrum rather than from specific peaks provide highly reliable results for concentration measurement and key properties such as Octane and Cetane Numbers, Distillation Properties and Vapor Pressure. An integrated temperature controlled density meter allows for exact determination and stability of fuel density. NEW! Data based on real samples collected and analyzed by SGS®! For predicted properties, MINISCAN IRXpert operates calibration data, that has to adhere to the strictest quality standards. As a unique feature the instrument is equipped with a database of samples that have been collected and analysed by SGS! MINISCAN IRXpert for testing fuels right from the street. A high end full color touch-screen facilitates menu navigation and allows in depth spectrum analysis. USB and Ethernet interfaces facilitate quick data-transfer, printing, LIMS integration and remote control and service. For field use, the MINISCAN IRXpert can be run with a 12V car adapter. Dedicated models for Gasoline or Diesel analysis are available, the professional model includes both, Gasoline and Diesel analysis. Dedicated models can easily be upgraded to a professional model. The ParaFuel™ NIR Process analyzer from LT Industries provides comprehensive inline analysis of Diesel, Gasoline, Jet Fuel, Kerosene, Crude Oil, Blending components and Blended Fuels for a wide range of critical properties including Octane, Distillation Points or RVP. The analyzer is also available in a benchtop version designed to improve efficiency when testing in laboratories. With the ParaFuel™ analyzer, accurate measurement of the properties of petrochemical products and crude oils is easy. Whatever the analytical need – inspection of crude oil or finished products, inline property measurements, or validating shipments – the ParaFuel™ can do the job. The optical analysis technique allows for easy integration and rapid inline measurement. ParaFuel™ Process Systems measures key chemical and physical properties rapidly and accurately directly in process, to monitor changing process conditions in real time and to adjust as necessary. The simple test procedure allows for greater experimental repeatability — and it does not require special operator skills. Inline Testing of up to 20 measuring points With the capability to measure 20 points with a single analyzer, you can validate quality and performance at all stages — from crude samples at the well to downstream refining. Improve your process knowledge and control. The ParaFuel™ Process Analyzer comes complete with probes and flow cells built to suit your measurement needs. They are available in a variety of lengths, configurations and materials depending on your measurement requirements. High pressure and temperature sampling probes can withstand the conditions associated with oil production and refining. Instruments are designed for direct integration into existing control systems via the LTBus automation & communication software. The ParaFuel™ Analyzer can communicate directly via standard protocols such as Modbus and 4-20mA. The ParaFuel™ Benchtop System provides the same high quality measurements as the process system. Automated, nondestructive inline analysis, completed within seconds. Results sent to your DCS, PLC, or LIMS. This true atmospheric distillation analyzer is extremely compact, portable and light weight and operates as a fully stand-alone unit. Designed for the quick and accurate quality control in laboratories and in the field, a distillation run on light products takes just 15 minutes and requires as little as 6 mL of sample. Because of its small size, the portable mini-distillation apparatus is the ultimate solution for places where limited or no lab-space is available. MINIDIS ADXpert uses full automation from sample introduction to heating regulation, vapor temperature registration, volume measurement in the receiver compartment and calculation of the distillation curve from the raw data obtained during the test. This way it achieves the highest levels of accuracy, repeatability and reproducibility. The automatic operation involves simply inserting the filling tube into the sample container and pressing “RUN”. No sample preparation like cooling is necessary; neither special programming of the test conditions or prior distillation knowledge is required. Fully automatic cleaning programs and the use of inexpensive and disposable sample cups guarantee highest productivity and eliminate the need for manual cleaning of glassware. MINIDIS ADXpert performs according to ASTM D7344, the New Mini-method for the Distillation of Petroleum Products at Atmospheric Pressure and generates detailed D86 test reports. The distillation apparatus has a resolution almost twice as good as D86 distillation units, yielding results that are well within ASTM D86 r/R requirements. The extremely versatile unit allows precise testing of various gasoline, jet fuel and diesel products (groups 0-4), biofuels, solvents, aromatics, organic liquids, chemicals and contaminated or blended samples. The automatic distillation analyzer MINIDIS ADXpert is revolutionizing ASTM D86 testing. It is a true atmospheric distillation analyzer in an extremely small format. The automation significantly improves the repeatability and the reproducibility of the highly precise results. The MINIDIS offers a detailed ASTM D86 compliant report and prints and/or transmits the results via a serial PC link. Broken glassware is one of the major reasons for fire hazards experienced when distilling with glass flasks. Because of the rugged metal housing, the sealed metal distillation cycle and the small sample volume, the MINIDIS ADXpert does not need a fire protection system. Cheap and durable metal sample cups instead of expensive glass flasks significantly reduce consumable costs and make the MINIDIS ADXpert a perfect solution for distillation testing within challenging environments. The MINIDIS ADXpert provides a complete distillation run and test report in 15 minutes (for gasoline) using only 6 mL of sample. The automatic operation involves simply placing the filling tube into the sample and pressing “RUN”. No special programming of test conditions or prior distillation test knowledge is required. With the automatic sample introduction, the pre-programmed rinsing cycle and the use of disposable sample cups, any test preparation or manual cleaning of glass parts is avoided. Applicable for gasoline, jet fuel and diesel products (groups 0-4), biofuels, solvents, aromatics, organic liquids, chemicals and contaminated or blended samples. Fast measurements, automatic cleaning and close to no waste allow for versatile applications in laboratories, at-line or in Mobile Labs. Classical D86 distillation analyzers often encounter so called “problematic” samples. Mining solvents, condensates and raffinates for example cannot be measured by a D86 analyzer in most cases. MINIDIS ADXpert incorporates a versatile temperature control for a very small sample volume, which allows easy and fast heater adjustment. So even “problematic” samples can be distilled until the final boiling point is reached! The highly accurate volume detection system allows for precise and repeatable analysis of Biofuels and vegetable oils mixtures. MINIDIS ADXpert performs according to the new D7344 standard for true atmospheric distillation. Results of the MINIDIS ADXpert excellently match D86, ISO 3405, IP123 and DIN51751 results. Fully automatic measurements, the temperature controlled sample introduction and a sophisticated automatic heating program eliminate sources for D86 distillation operator bias. MINIDIS ADXpert features true portability, the rugged housing and optional 12V vehicle battery operation, making it the perfect solution for all kinds of applications, where standard laboratory instrumentation can not be applied – such as measurements in the field or in mobile laboratories. PILODIST 107 is an easy to handele solvent recovery system for extremely pure solvents. The solvent mixtures are side products of extraction’s, washing processes, chemical and biochemical reactions, chromatographic operations in clinical range, especially in anatomical and pathological institutes. Solvent Recovery Unit with Concentric-Tube-Column. The system is equipped with a concentric-tube-column, i.e. highest separation efficiency and high load ranges. All kind of solvents like acetone, DMF, THF, parrafins,Xylenes, alcohol’s, acetonitriles, isooctane, hexane, methyl chloride and other HPLC-solvents. The processor controlled crude oil distillation system includes control of heating and vacuum as well as the display and storage of all important process values: The design is based on the distillation of a charge of 10 – 20 kg of crude oil in a minimum of time with a high throughput until a final temperature of 400 °C AET. The crude oil is charged into a stainless steel flask and heated by an electrical heating bath. All vapors are passing through a stainless steel column and are condensed in an integrated vertical condenser. An additional high performance condenser which is located on top of the column construction is required to condensate all remaining light boiling components. All condensed product is being discharged by means of a tempered gear pump into a tank (receiver) or a fraction collector. The discharge process is being performed independent from the current system pressure (atmospheric or vacuum) to avoid any manual discharge in between the different pressure conditions. Although the distillation column is packed with Propak 316 and the controller allows to perform all required distillation runs (atmospheric and vacuum 1 – 3) the system is similar but not strictly designed according to ASTM D-2892 – standard. The system can be operated alternatively with fraction collector or with the intermediate receiver for larger cut volumes as well as the determination of the actual distillation rate. Both collection systems are included in the scope of supply. The crude oil distillation system is designed to work in semi-automatic operation mode and combines all required features of PETRODIST 100 S, PETRODIST 200 S and PETRODIST 300 M in a single system in the most economical way. One distillation procedure can be used at a time (alternatively but not simultaneously) by using the following central components which are used by all distillation methods. These common devices include the fraction collector (not for D-1160), central controller and laptop, vacuum supply and cooling thermostat. The capacity of the fraction collector can be verified depending on the flask volume by exchanging the insert construction to allow either 18 receivers of 500 mL or 9 receivers of each 1 L.
All distillation results can be entered into an Excel file to be stored as well as for calculation of final results and printout of a distillation curve. Both systems can operate at the same time (simultaneously) in fully automatic, uninterrupted and unattended mode. The data evaluation software provides also a combined TBP-curve for both systems. Compact design with control system and safety items for unattended operation. No operator intervention and no intermediate stops are required. All necessary accessories will be supplied together with the system. The installation requires water, nitrogen, compressed air and electricity. The system enables to perform TBP- and Potstill – distillations of various crude samples according to ASTM-standards and is designed for laboratory use. The system is equipped with a central computer control, vaccum supply and thermostate system, data storage and evaluation station as well as a fraction collector, designed to serve for both distillation systems simultaneously and provides direct automatic distillation flow rate control. The fraction/receiver changes are automatically performed according to preselected cut temperatures or in case of receiver overfilling. Both systems are equipped with individual fraction collectors to allow simultaneous operation of both systems. The final data and the TBP-curve in wt% and vol% are printed out after reweighing the residue. The unit requires water, nitrogen, compressed air and electricity. Dry ice or liquid nitrogen is required for cold traps. Crude oil distillation system for semi-automatic operation exactly according to ASTM D-2892 (TBP). After each run, the system stops automatically and the flask temperature has to be cooled down prior to the next distillation run. The operator has to enter the parameters for the next run to restart operation. The system contains a vacuum tight automatic fraction collector with 9 receivers for each run, which have to be replaced after each distillation run. The receiver change is performed according to pre-selected boiling temperature or when a receiver is filled up. Fully automatic crude oil distillation system, processor controlled according to ASTM D-1160 for the determination of boiling ranges of crude oil products under vacuum. The system can be operated in strict accordance to the ASTM procedure with 1 single receiver or alternatively, by using the automatic fraction collector, with 4 receivers. There are manual, semi-automatic and full-atomatic models of Petrodist 300 Series. Fractional collecter is provided with 300CC-F model. For more information and all technical details, please contact us. The system has been designed to operate under atmospheric as well as vacuum conditions down to 1 Torr in continuous and discontinuous (batch) mode by using either a circulation evaporator with level sensors or a distillation flask with electrical heating mantle. This specific system is completed with an automatic fraction collector which operates 10 receivers. It is designed with 4 distillation columns with silvered high-vacuum mantle and packed with SULZER packing and additional electrical column heating mantles to ensure adiabatic operation. No additional tools are required for an easy and convenient handling! The Sindie® 7039 Benchtop model is specifically designed for fast batch testing from 0.15 – 3000 ppm (wt.) sulfur fuel samples at petroleum pipeline terminals, refineries, and test laboratories. The unit is compact and fits on any lab bench with an easy-to-use and robust design for industrial and laboratory use with minimal maintenance. The Sindie ® analyzer has many advantages over competing technologies. The analyzer has exceptional signal-to-noise using monochromatic excitation of the X-ray source characteristic line. It does not require consumable gases or high-temperature operations improving the analyzer’s robustness and reliability. Sindie 7039 Benchtop complies with ASTM Standard D-7039. Sindie ® 7039 Benchtop meets or exceeds the performance of other X-ray fluorescence-based ISO and ASTM test methods including ISO 20884, for the measurement of sulfur in refinery fuels. MWD XRF Monochromatic Wavelength Dispersive X-Ray Fluorescence (MWD XRF) utilizes state-of-the-art focusing and monochromating optics to increase excitation intensity and dramatically improve signal-to-background over high power traditional WD XRF instruments. This enables significantly improved detection limits and precision and a reduced sensitivity to matrix effects. A monochromatic and focused primary beam excites the sample and secondary characteristic fluorescence x-rays are emitted from the sample. A second monochromating optic selects the sulfur characteristic x-rays and directs these x-rays to the detector. MWD XRF is a direct measurement technique and does not require consumable gasses or sample conversion. Total chlorine analysis from aqueous solutions and aromatic products to heavy fuels, crudes, and catalyst. For use in refinery labs, pipeline terminals, additive plants and inspection laboratories. Complies with ASTM D2622, D7039, D7536, and SH / T 0842. LOD: 0.4 ppm at 300 s.
LOD: 0.3 ppm at 300 s.
Automatic sulfur correction for chlorine. 37 cm (w) x 50 cm (d) x 34 cm (h). Trusted Precision Using the industry’s most advanced optics, doubly curved crystals, Sindie +Cl achieves a high signal-to-background ratio for the most reproducible results. Monochromatic Wavelength Dispersive X-Ray Flourescence (MWDXRF) using doubly curved crystal optics has the advantage of very high sensitivity and precision. This technique has been successfully used to deliver very precise measurements of low levels of sulfur and chlorine. Petra 4294 complies with ASTM D4294, ISO 8754 and IP 336 methods for sulfur analysis of hydrocarbons like crude oil, diesel, gasoline, jet fuel, and lubricants. The Clora Benchtop analyzer is designed for use with liquid hydrocarbons such as aromatics, distillates, heavy fuels and crude oils, as well as aqueous solutions. The enhanced precision of Clora is ideal for testing related to catalyst poisoning in reformers or for sites with fluid catalytic crackers and hydrocrackers monitoring very low levels of chlorine. Monochromatic Wavelength Dispersive X-Ray Fluorescence (MWD XRF) utilizes state-of-theart focusing and monochromating optics to increase excitation intensity and dramatically improve signal-to-background over high power traditional WD XRF instruments. This enables significantly improved detection limits and precision and a reduced sensitivity to matrix effects. A monochromatic and focused primary beam excites the sample and secondary characteristic fluorescence x-rays are emitted from the sample. A second monochromating optic selects the chlorine characteristic x-rays and directs these x-rays to the detector. MWD XRF is a direct measurement technique and does not require consumable gasses or sample conversion. Dynamic Range 0.07 ppm wt. up to 3000 ppm wt. From crude oil to bio-fuels in additives or water, the Phoebe® Bench-Top Analyzer delivers unprecedented precision and accuracy for quantification of phosphorus analysis. Based on XOS’s MWD XRF analytic platform, (as found in Sindie ® and Clora ®analyzers) Phoebe ® offers a LOD of 0.4 ppm in hydrocarbon matrices in a ten-minute measurement cycle. The analyzer’s extreme ease of use with straightforward touch screen operation allows for use in a broad range of industrial environments. Phoebe ® is a “plug it in and measure” analytical solution and does not require extensive sample preparation, consumable gasses or sample conversion. Monochromatic Wavelength Dispersive X-Ray Fluorescence (MWD XRF) utilizes state-of-the-art focusing and monochromating optics to increase excitation intensity and dramatically improve signal-to-background over high power traditional WD XRF instruments. This enables significantly improved detection limits and precision and a reduced sensitivity to matrix effects. A monochromatic and focused primary beam excites the sample and secondary characteristic fluorescence x-rays are emitted from the sample. A second monochromating optic selects the phosphorus characteristic x-rays and directs these x-rays to the detector. MWD XRF is a direct measurement technique and does not require consumable gasses or sample conversion. LOD 0.4 ppm in 600s. Dynamic Range 0.4-3000 ppm wt. From gasoline to ethanol and toluene, the Signal benchtop analyzer delivers unprecedented precision and accuracy in quantitative analysis of silicon in petroleum. The analyzer is based on XOS’s MWDXRF technology platform (as applied in Sindie® and Clora® analyzers) ensuring a robust analysis solution for demanding petroleum and industrial evironments. Silicon (Si) contamination continues to impact fuel quality, resulting in costly engine failures and catalyst fouling. ASTM test method D7757 compliant, the Signal uses proven, state-of-the-art technology to provide exceptional Si analysis. Know the contamination sources and develop working solutions. Understand the impacts of Si contamination on your business. Determine your Si baseline for future specifications set by ASTM or the end user. MWD XRF Monochromatic Wavelength Dispersive X-Ray Fluorescence (MWD XRF) utilizes state-of-the-art focusing and monochromating optics to increase excitation intensity and dramatically improve signal-tobackground over high power traditional WD XRF instruments. This enables significantly improved detection limits and precision and a reduced sensitivity to matrix effects. A monochromatic and focused primary beam excites the sample and secondary characteristic fluorescence x-rays are emitted from the sample. A second monochromating optic selects the silicon characteristic x-rays and directs these x-rays to the detector. MWD XRF is a direct measurement technique and does not require consumable gasses or sample conversion. HD Maxine ® assures precise determination of trace metals in crudes, lubricants and used oils without extensive sample preparation or expensive consumables. The analyzer enables the direct analysis of metals from Phosphorus to Lead, at unprecedented detection limits in a robust analyzer configuration designed to perform in demanding petroleum and industrial environments. Plug it in and measure. Results with one touch. Unrivaled precision. HDXRF High Definition X-Ray Fluorescence (HD XRF) is a multi-element analysis technique offering significantly enhanced detection performance over traditional ED or WD XRF. This technique applies state-of-the-art monochromating and focusing optics, enabling multiple select-energy excitation beams that efficiently excite a broad range of target elements in the sample. Monochromatic excitation dramatically reduces scattering background under the fluorescence peaks, greatly enhancing elemental detection limits and precision. HDXRF is a direct measurement technique and does not require consumables or special sample preparation. In the lab, in the process, in the field – the CALIDUS Gas Chromatograph is fast becoming the leading choice for GC applications in a wide variety of industry and environmental applications. With the ultrafast, ultra-user-friendly, highly durable, practical, reliable and economical CALIDUS GC you will find more measurement solutions faster and easier, produce better quality products, increase productivity and profitablity, with far less hassle and environmental impact. Whether you are directly involved in fuel characterizations or not, the new D7798 method is important to you. If you are directly involved in fuel characterizations, D7798 is vitally important to your industry. This ultrafast method can perform simulated distillation nearly 6 times faster than the previous method (D2887). With its patented modular columns and detectors platform, application range is second only to analytical speed in the list of CALIDUS GC advantages. Designed to provide accurate and reliable measurements for a variety of the applications commonly found in the Oil and Gas industry. The Model 131 design offers many features while still offering a level of simplicity, affordability and reasonable delivery times that many end-users desire. Envents capability to provide customized sample conditioning systems, integration services and the necessary analytical accessories makes the Model 131 an excellent choice for many analytical process measurement requirements. Start or stop analyses and calibration cycles. Generate and save current and historical analysis, raw data, and calibration reports. Review and modify analytical settings. Upload and display multiple chromatograms for comparison. Upload, download and display months of archived data. Setup independant automated stream switching. Gas Processing: Plant Inlet, Sales/Outlet, Sour Gas Pipeline Blending. Amine Units: H2S for sulfur balance/acid gas. NGL Fractionation: De-ethanizer, De-propanizer and De-butanizer tops and bottoms. Waste and Fuel Gas Analysis. Designed to provide accurate and reliable measurements for a variety of the applications commonly found in the Oil and Gas industry. The Model 132 design offers many features while still offering a level of simplicity, affordability and reasonable delivery times that many end-users desire. Envents capability to provide customized sample conditioning systems, integration services and the necessary analytical accessories makes the Model 132 an excellent choice for many analytical process measurement requirements. Porla Analyser can analyse heavy and crude oils that cover extremely wide viscosity and asphaltene content ranges from very high to very low. Very often, low asphaltene content oils cause blending and process problems. In addition, the new Porla has an analysis programme for blending the parameter of asphaltene free oils and blend components. Furthermore, Porla is perfectly suited to the analysis of bitumen. Porla will report a comprehensive set of stability and compatibility parameters such as P-value, Pa, Po, FR5/1(toluene/xylene equivalent), FRmax, In and Sbn all in one operation. As a result of the exceptionally wide applicability area, Porla will result in the biggest benefits and profitability increases to end-users. The unique detector technology of New Generation Porla, based on the reflection of asphaltene sensitive light, facilitates the applying of a low dilution of oil samples, resulting in the accurate analysis of oils containing as little as 0.1% asphaltene and sometimes even lower. Other particles besides asphaltenes, such as coke, do not disturb the Porla analysis. Therefore, the removal of coke prior to analysis is not necessary. New Generation Porla is a very useful and practical tool for planning and monitoring the blending of feedstocks/crude oils, heavy oil blending (from cracking bottoms and solvents), the blending of bitumen and optimisation of cracking units (e.g. thermal and hydrocracking) of oil refineries. In addition, New Generation Porla can also be used for monitoring visbreaking processes and the dilution of tar sands with light ends in the production fields of tar sand crudes. Besides its unique performance in analysing the stability and compatibility parameters of low asphaltene content oils, the New Generation Porla Analyser includes an automatic procedure for analysing the ExxonMobil heavy and crude oil blending model parameter Sbn (solubility blending number) of asphaltene free oils and blend components. We have made the New Generation Porla operation easy for end-users. Operation of the analysis programme is very simple and easy. The programme gives default values to the operator to prepare the stock solution, and there is no need to prepare more than one stock solution from oil to be analysed and an aromatic solvent. We offer strong application development support for Porla end-users when commissioning the analyser at a customer site/laboratory. Our expert will remain at the customer’s laboratory for 4-5 days to give user-training and run a wide range of oil samples with the operator, which can be analysed in the laboratory. He will also give instructions concerning sample preparation and the running parameters of these oils. As a result of this service, the end-user has ready applications for different oil types and an understanding on how to built applications for possible new oil types. This service will ensure a smooth start for new Porla end-users. Sometimes, some new oils to be analysed might seem challenging or the analysis results may look a bit peculiar. For those situations, we have a special service for our Porla users. The only thing the Porla end-user needs to do is send a sample to our application laboratory in Finland. We will analyse the sample free of charge in our laboratory, report the results and give instructions on how the oil sample can be prepared and successfully analysed in the future. The only cost that the end-user must pay is the transportation of the sample to our laboratory. The DR5 is a cold properties analyzer. A unique interchangeable cartridge system allows cloud, pour, and CFPP on the same machine. The DR5 is single position. There are three types of cartridges: cloud, pour, and CFPP. Each DR5 comes with a single cartridge. Upon ordering, please specify which cartridge type to include. Additional cartridges can be bought as accessories. The DR5’s state-of-the-art cooling system allows temperatures from -120°C to 60°C. It cools at a rate of 1° C in 5 seconds or less. It maintains temperature of +- 1°C. Cloud, pour, and CFPP on a single machine. Fully contained, maintenance-free refrigeration system. View current test in real-time from a PC, tablet, or smartphone via wifi or ethernet. Easily export test data to LIMS, flash drive, or web browser. In addition to standard tests, the machine can be set to maintain a certain temperature, which is convenient for various lab activities. Note: “Plunge Style” indicates a large initial drop in temperature and then maintaining that temperature. This allows for faster test results. It gives an approximation of the test result but is no substitute for ASTM tests. This was provide via customer request. Apparatus to determine the cloud and pour point manually conform ASTM D97 and ASTM D2500. The TLC adjustable circulator bath with position for six jackets. The pour point describes a procedure for testing the fluidity of a petroleum product at a temperature. The cloud point is defined as the temperature of a liquid specimen when the smallest observable cluster of wax crystals first appears upon cooling. Complete ASTM D1298 set-up for three positions (including frame, cylinders, lids, tubing, connectors and TLC15-5 circulator). The set-up has a small footprint, detachable leakage tray and is easy to drain and clean. The set-up is made from stainless steel and offers complete sight over full hydrometer length. This test method covers the determination of the relative density and density of semi-solid bituminous materials, asphalt cements, and soft tar pitches by use of a pycnometer. The sample is placed in a calibrated pycnometer. The pycnometer and sample are weighed, then the remaining volume is filled with water. The filled pycnometer is brought to the test temperature, and weighed. The density of the sample is calculated from its mass and the mass of water displaced by the sample in the filled pycnometer. The bath has place for nine pycnometers. The Density4 and Density5 density meters continue providing robust and reliable analytical analysis for the needs of many industries. With the push-of-a-button this instrument provides accurate density measurements of liquids for analysis and quality control. Condensed into a compact, robust, stand-alone unit, this density meter is a reliable workhorse for the laboratory, resisting damage from demanding applications. Instruments feature an exclusive plug and play replaceable pre-calibrated measurement cell exchange for the lowest maintenance costs and shortest downtime. These density meters easily combine with AR Series refractometers, AR9 and AR5, and polarimeters, Polar2 and Polar3, for the simultaneous determination of measurements. Measuring time per sample < 10 sec. < 30 sec. TC16 circulator with temperature range from ambient to 250°C, 115V-60Hz., temperature stability ± 0.02°C. Bath conforms to ASTM D130, ASTM D4048, ASTM D7095, EN/ISO 2160, DIN 51811, IP154 and IP112. It is equipped with a cover with six holes and lids for six test stations. TB30 bath with temperature range from ambient to 80°C, 230V-50Hz~60Hz, temperature stability ± 0.02°C. Bath is conform ASTM D1838, EN/ISO 6251, IP411, BS2000 Part 411, BS6924, NF M41-007 and is specifically designed to hold a temperature stable at 37.8°C without the use of an external circulator. The bath is deep enough to accommodate four corrosion test cylinders in an upright position. TC16 circulator with temperature range from ambient to 250°C, 230V-50Hz~60Hz, temperature stability ± 0.02°C. Bath conforms to ASTM D4814, ASTM D7667, ASTM D7671, IP 227, and IP 611. It is equipped with a cover with six holes and lids for six test stations. Methods specify the determination of the corrosive tendencies towards silver, of aviation turbine fuels, automotive spark-ignition engine fuels, or automotive gasoline. The result is classified as an integer in the range 0 to 4. TC40 set-up for D849 to determine the corrosiveness to copper from aromatic hydrocarbons. . The set-up consists of a TC40 circulator bath and it is standard delivered with six sets of glassware (250 mL flask and condenser). The cover of the bath has six openings with lids and a leveling platform. Two stand rods with six clamps to hold the glassware in the same position are standartly supplied. The temperature range is from ambient +5°C to 250°C. The economical AR5 digital refractometer with Peltier temperature control included makes sophisticated measuring technology available to users on a tight budget. High-end accuracy and a good price point give customers an exceptional advantage in the laboratory. The AR5 is precise, measuring refractive index and % Brix with results accurate to 0.0001 RI and 0.05% Brix. The AR5 is the ideal instrument to perform routine measurements with standard scales and has the ability to be configured for custom measurements. The robust design, sapphire prism and reliable operation make it a workhorse for the laboratory, resisting surface damage from demanding applications. Measuring Scales Refractive index (RI), % Brix and other standard scales included. User defined scales available. This top of the line refractometer is exceptionally precise with measurement accuracies of 0.00002 refractive index (RI) and 0.02% Brix. With a built-in Peltier thermostat, the AR9 controls the temperature at the sample interface to an accuracy of 0.03°C. This unit is resilient and durable, making it the right choice for all laboratory requirements. As a robust sealed system, the AR9 is able to perform in a variety of environments. This refractometer has the capability to provide measurements for the most critically regulated industries. The AR9 has a YAG (Yttrium Aluminum Garnet) prism, the hardest prism available, guaranteeing accuracy and resilience for years. The Universal Display is included with the AR9 at no charge. Measuring Scales Refractive index (RI), %Brix and other standard scales included. User defined scales available. The new modular circular polarimeter Polar2 is designed for analyzing optically active substances. These robust instruments are the most accurate, with a linear response throughout the measurement range. For application in universities, technical colleges for training students. The solvent circulates between extraction vessel, evaporator and condenser. The solid matter in the extraction vessel is continuously rinsed with purified solvent until all solubles are leached out of the solid matter. The solvent, which is charged with the extract, flows from the extraction vessel into the evaporator, where the extract will be collected and concentrated. After terminating the leaching process, a further purification of the extract by evaporation is possible. The system is designed for batch (discontinuous) operation but can also be operated semi-continuously. The standard system can be operated either for vacuum operation or overpressure operation as well. The system can be designed either in glass, stainless steel or other material, depending on the application. 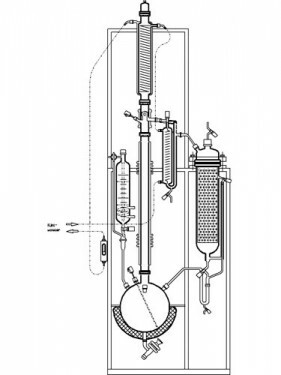 This mixer-settler apparatus has been designed to study liquid-liquid-extraction processes. One part of the component, which has to be separated from the liquid phase (raffinate phase) is extracted by means of a liquid solvent (extract phase). This component is concentrated in the solvent (extract phase from the extraction phase to extraction phase). The raffinate phase and the extract phase will be led through the system in opposite directions. The advantage of the mixer-settler apparatus is the high efficiency of the exchange stages. The latest re-design of EMS 250 SR liquid-liquid extractor consists of a 10-stage Mixer-Settler arrangement to work simultaneously. Each stage consists of a mixer with downstream settler. In the mixer the light and the heavy phase from the neighbouring stages are brought together, are intensively mixed and then simultaneously conveyed into the settler. The mixing is realized by motor driven spiral stirrers for each mixing stage. Due to the intensive mixing the phases are divided into drops, so that the greater exchange surface, the substance transfer from one phase to another is heavily intensified. Together with the component to be extracted, e.g. heavy phase, the raffinate phase is pumped from the raffinate store into the mixer of the last stage of the extractor. The solvent, e.g. light phase is pumped from the corresponding store tank into the mixer of the first stage of the extractor. Both phases, raffinate and extract are led into opposite directions through the extractor, the raffinate phase from the last stage and the extract phase from the first to the last extraction stage. On it’s way through the apparatus the component which is to be extracted, is increasingly separated from stage to stage. Simultaneously the solvent stream (extract phase) absorbes more and more of the extracted component. The raffinate phase from which the component has been extracted, leaves the extractor at the first stage and is collected in a collecting vessel. The extracted phase leaded with the extracted component leaves the extractor at the last stage and is collected in a collecting vessel. Contrary to other separation methods, the extraction will not directly lead to pure components. The extract phase is e.g. to be separated in a downstream distillation/rectification into extracted component and solvent. This extraction process has the advantage of a low energy consumption for the separation of various compounds of liquid mixtures and is ideally applicable for demonstration purposes as well as for studying liquid-liquid extraction fundamentals in research and education. Universal apparatus for thin-film evaporation for lab-scale and pilot-scale application, complete with all necessary accessories for continuous operation. 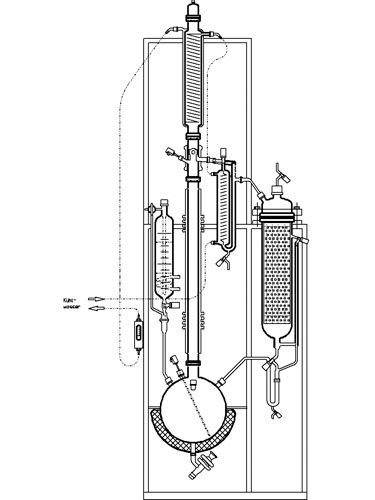 Rotary thin-film evaporator with thermostat mantle and external condenser. The model TF 650 is excellently suited for universal lab-scale and pilot-scale application and is completely equipped with all necessary accessories for the continuous operation. Short-path evaporator apparatus for lab-scale or pilot operation. Rotary thin-film evaporator with thermostat mantle and internal condenser for continuous short-path distillation or gentle concentration of thermally sensible products. Suited for laboratory or pilot operation. The pilot operation data and experimental values can be transferred to bigger systems. The standard system uses PTFE rolling wiper elements. Other wiper elements are available. Universal lab-scale apparatus for short-path evaporation. Rotary thin-film evaporator with thermostat mantle and internal condenser for continuous shortpath distillation or gentle concentration of thermally sensible products. Suited for laboratory or pilot operation. The pilot operation data and experimental values can be transferred to bigger systems. The standard system uses glass wiper elements. Other wiper elements are available. Mobile table to accommodate system and accessories can be ordered optionally. Portable ozone generators especially suited for reliable laboratory and pilot plant application; for oxygen and dried air as feedgas. High ozone concentration in oxygen. The ozone generating module is made of inert material and is build together with the power supply and the instrumentation into a 19” aluminium housing (protection class IP 42) with air cooling. The gas flow is adjustable at the needle valve of the flow meter. The electrical power consumption is shown at the LCD display. The ozone concentration can be regulated between 5 and 100 % by means of an electrical controller or an external signal. The OZON analyzer OPF 200 is an accurate UV-photometer for the continuous measurement of the ozone concentration in the range 0 – 200 g/m3 in the gas phase. The UV-system allows a measurement at 254 mm wavelength according DIN and IOA-Standard without any cross selection to other gas species. The instrument needs no moving parts and consists of single beam photometer. The UV-lamp has a very stable intensity and has to be replaced every 24 months. The analyser consists of an internal catalyser for the destruction of ozone in the sample flow. The unit is especially suited for ozone measurements at the output of ozone generators resp. ozone producing systems. A truly versatile Coulometric Karl Fischer Titrator for water content determination of gases, liquids and solids. The Aquamax KF PLUS is a small foot print titrator with a full numeric keypad for data entry and results manager software for data storage and retrieval. As well as being a stand-alone instrument, this titrator can be combined with accessories such as an Oil Evaporator or a Solids Evaporator system. Aquamax KF Reagent A is a general coulometric KF anolyte for use with generator electrodes which incorporate a frit or diaphragm to separate the anode and cathode chambers. Used in conjunction with Aquamax KF Reagent C this formulation is supplied in a pack of 8 x 100ml bottles and 8 x 5ml cathode ampoules, all conveniently located in a single carton. This UN certified carton can be used to transport these reagent packs by road, rail, sea and air and the total pack volume is less than one litre so they can be shipped as limited quantity. To conform to ASTM, API, EI, ISO (plus other) methodologies for water content determination of oil and petroleum products, the anode regent must be modified with xylene to improve sample solubility and miscibility. Aquamax KF Reagent A is pre-cut with xylene, and other solubilizers to eliminate side reactions, so that the operator does not have to store or mix chemicals. We conducted extensive comparison trials of Aquamax KF Reagents against other leading brands with very positive results. Using water standards ranging from 10 µg water up to 10,000 µg water under controlled conditions we found Aquamax KF Reagent to be equivalent in perfomance accuracy to the other brands but much faster in titration speed and with low background drift value. Modernised with chemical resistant anodised aluminium side panels and improved features. I.C.E. (Integrated Configuration Environment) is a Windows® based program that accompanies all 3308 Analyzers for full configurability. Field friendly interface via front display panel. Numerous modes of communication including 4-20mA outputs, alarm outputs, solenoid drivers, serial Modbus and Modbus TCP. The Envent Flanged Dilution Probe eliminates problems associated with sampling high H2S concentrations in wet, dirty gas at low pressure. This Model 331S Transportable is designed as a temporary H2S analyzer solution. The 331S utilizes field proven tape based technology that provides a linear and interference-free output of H2S. Certified for Class I, Div 2, Groups A, B, C and D.
This uniquely rugged and simple design by Envent utilizes a lead acetate based detection system that provides a linear and interference-free output of H2S or optional Total Sulfur concentration. A transportable system that can measure H2S in natural gas anywhere you need it. This uniquely rugged and simple design by Envent utilizes a lead acetate-based sensoring system that provides a linear and interference-free output of the H2S concentration. The Model 330S H2S Analyzer utilizes field proven tape based technology that provides a linear and interference-free output of H2S. An optional Total Sulfur measurement can be added to the analyzer. Certified for Class I, Div 1, Groups C and D (Group B available). The Sulfur Sentry utilizes field proven tape based technology that provides a linear and interference-free output of H2S for portable monitoring. Comes complete with a sample conditioning system. Rechargeable 12 volt battery operates independantly for up to 24 hours with no external power source. Battery charger is included. The Model M60 is designed to monitor PPM and percent level O2 concentrations in natural gas applications. An electrochemical O2 sensor is incorporated into the design of the instrument. The M60 can be included as an additional measurement with other Envent analyzers, or can be offered as a stand-alone analyzer with an intergrated sample conditioning system. RS-232 and RS-485 configurable Modbus communications. Available with differing sample systems and accessories as required in various applications. Storage tank blanket gas and other headspace applications. The M90 dual-beam infra-red carbon dioxide detection systemcontinuously measures and corrects for the short and long-termconcentration changes that caused measurement errors in first generation (single beam) carbon dioxide sensors. CO2 is measured routinely in natural gas for product quality and process control purposes. Common ranges are from 0-5% for sales gas and up to 0-30% for inlet CO2 concentration. Certain H2S-removal chemical processes can be fine-tuned by CO2 slipstreaming. Quantify CO2 as a combustion by-product. The TFS1 is an all optical analytical platform using a Precisive TFS (tunable filter spectroscopy) infrared sensor from MKS Instruments. The TFS1 offers a multi-component gas analysis at unparalleled speed. The standard Envent TFS1 measures methane, ethane, propane, iso-butane, iso-pentane and a combined measurement for (n-butane, n-pentane and n-hexane), as well as % level CO2 and H2S. The spectrometer utilizes a tunable Fabry-Perot assembly that provides wavelength scanning along with advanced spectral processing that can produce response times as fast as 1 to 10 seconds. Additional measurement options are available depending on the application. This includes component analysis for the HPI market such as ethylene, propylenes, and butenes (Canada, Mexico and Middle East). Sampling is with a flowthrough cell, suitable for continuous, online, unattended operation. The analyzer does not require carrier gas, fuel gas or on-site calibration gas. The standard Envent system configuration provides measurements of up to 100% methane, 25% ethane, 25% propane, 10% butanes and 5% pentanes, 100% H2S and 100% CO2. Diatomic compounds such as nitrogen, oxygen and hydrogen are not measured directly and are combined and reported as one group of unmeasured inert gases. Fast response times from 1 to 10 seconds. Multi-component hydrocarbon gas analysis plus percent level H2S and CO2. Wide range of additional components/ recipes to choose from. Advanced software provides full configurability. Natural Gas measurements including processing, transmission, storage and distribution. BTU & Wobbe Index analysis. The TFS2 is an all optical analytical platform using a Precisive TFS (tunable filter spectroscopy) infrared sensor from MKS Instruments. The TFS2 offers a multi-component gas analysis at unparalleled speed. The standard Envent TFS2 measures methane, ethane, propane, iso-butane, iso-pentane and a combined measurement for (n-butane, n-pentane and n-hexane), as well as % level CO2 and H2S. The TFSP is an all optical analytical platform using a Precisive TFS (tunable filter spectroscopy) infrared sensor from MKS Instruments. The TFSP offers a multi-component gas analysis at unparalleled speed. The standard Envent TFSP measures methane, ethane, propane, iso-butane, iso-pentane and a combined measurement for (n-butane, n-pentane and n-hexane), as well as % level CO2 and H2S. ROW Exd oil spill detector is designed to detect oil contamination in the hazardous areas where ignitable concentrations of flammable gases, vapors or mists often exist. ROW Exd Oil Detector is encased in flameproof (Exd) 3rd party certified enclosure, made of 316L stainless steel, which is acid and corrosion resistant making it ideal for the toughest enviornments. IP68 certified non-contact Exd oil detector, using UV fluorescence method — highest rated on the market. Outstanding detection range of 8m — twice the distance in comparison to similar products on the market. Advanced software algorithms are calibrated to detect oil down to single-micron layers and minimize false alarms. ROW Exd Oil Detector can be installed within a network of LDI’s ROW Stainless Steel and ROW Aluminium devices, making expansion of existing ROW networks exceptionally convenient. Early warning system for harmful algal blooms by determination of cholophyll-a concentration changes. WHAT ARE ALGAL BLOOMS AND WHY MONITOR THEM? Algal blooms tend to form in presence of ideal condition of temperature, nutrients and light. Algal blooms become harmful when colonies of algae—simple plants that live in the sea and freshwater—grow out of control while producing toxic or negative effects on people, fish, shellfish, marine mammals, and birds. The human illnesses caused by harmful algal blooms, though rare, can be debilitating or even fatal. Harmful algal blooms’ occurence are on the rise and are becoming a major environmental concern in many states, not only because they affect the health of people and marine ecosystems, but also the prosperity of local economies. In consequence, governments and environmental authorities request effective algal bloom monitoring tools. Chlorophyll-a concentration is the most commonly used parameter for measuring algal concentration or biomass, and assessing the occurence of algal blooms. All photosynthetic organisms contain chlorophyll. Among all forms of chlorophyll, only chlorophyll-a is common to all algae. A few micrograms of chlorophyll-a per litre are considered to be normal. Concentrations beyond 10 or 20 μg/L are evaluated as algal bloom. Only a small amount of the algal biomass is eaten by zooplankton, the remains sink to the bottom where they are decomposed by bacteria. Oxygen at the bottom can fall to stress levels for most organisms or even to near zero - causing death of the ecosystem in the area. Early warning system for determination of water treatment by monitoring of dissolved organic matters (DOM) concentration changes. ROW DOM monitors the levels of fluorescent dissolved organic matters (fDOM). DOC concentrations greater than 5 mg/L will complicate water treatment and may result in disinfection by-products and water with less than 2 mg/L of DOC tend to be easily treated for disinfection by-products and do not increase finished water colour. WHY DISSOLVED ORGANIC MATTERS MUST BE MONITORED? Dissolved organic matter (DOM) does not pose health risk itself but may become potentially harmful when in combination with other aspects of water. DOM reacts with disinfectants such as chlorine to form potentially carcinogenic byproducts called trihalomethanes. Trihalomethanes may have long-term effects on health and they should be considered when chlorinating drinking water high in DOM. DOM interacts with organic/inorganic contaminants and affects their transport, stability and bioavailability. Moreover, most pesticide models require DOM as one of the main parameter inputs. DOM can also promote the growth of microorganisms by providing a food source. Organic material in water can cause aesthetic problems such as an unpleasant taste, odour and colour. Fluo-Imager™ is a multipurpose spectral analyser aimed at the express detection and identification of organic compounds in liquid samples. Its operation is based on the techniques of spectral fluorescence signatures (SFS) and pattern recognition. With these techniques different compounds in a mixture can be identified and quantified without the physical separation of individual substances in a sample. Fluo-Imager™ is capable of performing both absorption spectra measurements and capture SFS simultaneously. The principle of SFS is based on the measuring of the fluorescence intensity of a sample at different excitation and emission wavelengths. The intensity of light induced fluorescence as a function of excitation and emission wavelengths constitutes a 3-dimensional fluorescence matrix of the sample. Such matrix is called the Spectral Fluorescence Signature. Since various chemical substances have different characteristic excitation and emission spectra of fluorescence, they typically produce different spectral patterns in SFS, which are used for substance identification. The intensity of fluorescence serves as a measure of substance quantity. Remote Optical Watcher Autonomous non-contact sensor for detection of oil on water and land Highly accurate, easy to maintain, fi nds oil spills early so you can respond before things get out of hand. 24/7 Operation Even in Harsh Environments Day or night, in arctic cold or scorching heat, ROW helps you pinpoint the polluter, take action, and avoid lasting damage. Available in anodised aluminium, 316 stainless steel and now Exd enclosures for even the toughest environments. Long Life, Low Maintenance Robust IP68 certified hermetic design and 5 year LED-lifetime. Low power consumption of < 2W with optional remote operation using solar panels or battery. Pressurized for Your Protection Pressurized with inert nitrogen, ROW has been built to be a neutral observer. Sold Globally, Serviced Locally We can ship the product anywhere in the world, safe in the knowledge that it will work. On-site service is provided by our local partners, ensuring timely and competent care for your ROW system. Where needed, LDI specialists in Estonia can be reached for consulting and feedback. How ROW Works The Science To detect oil slicks as thin as a single micron from up to 10m above the water, ROW pulses a UV beam at the surface and excites any oil molecules in the target area. Using oil’s native fluorescence, ROW identifies tell-tale substances and alerts the site operator. After 20 years of developing remote-sensing systems we’ve probably mastered the technology better than anyone else. Full Autonomy In most cases, ROW will operate on wired power and data lines. However, for full autonomy in hard-to-reach locations, optional solar panels and wireless setups are available. Industry Leading Sensitivity - 1m Advanced software algorithms are calibrated to detect oil down to single-micron layers and minimize false alarms. Monthly fuel exchange test results over the past decade from ASTM and the Energy Institute have demonstrated that the IQT™ combustion pressure recovery ignition delay is highly correlated to the ASTM D613 cetane number (CN). The Test Method can accurately measure the ignition delay of a wide range of middle distillate fuels over the entire cetane number scale including conventional diesel fuels, oil sands-based, biodiesel, refinery streams, specialty fuels, as well as fuels with nitrate-based and oxygenate-based cetane improver additives. Based on a model developed from well characterized ASTM NEG fuel remnants (see reference 1), the IQT™ results are displayed in real time in ignition delay and derived cetane number (DCN) formats. The test sequence is completely automated and is performed in under 20 minutes (including sample and system preparation). Test results and statistical analysis are printed at the end of each test, permitting the operator to quickly read the computerevaluation of test validity. Accurate monitoring of corrosion rates in any environment is critical when viewed in terms of the maintenance and repair costs associated with corrosion and material failure. Test coupons provide an inexpensive means of on-line monitoring that will allow you to effectively measure the corrosivity within your system. By observing the mils-per-year corrosion rate of an exposed coupon, valuable information can be provided regarding the material’s life expectancy. Biolab can make coupons in any size, shape, or material you need. Coupons can be stenciled with alloy and sequence numbers for proper identification. Mill test reports, identifying element compositions of materials used, are provided on all orders. The following coupons are four of the most commonly used in corrosion testing. Mill - finished as produced from mill. Glass Bead - blasted with fine glass beads to remove mill scale. 120 Grit - fine finish using a 120 grit belt. Commonly used in corrosion tests, such as pitting studies, where smooth surface finish is desired. Finishes up to 600 grit (extremely fine) can be provided. Double Disc Ground - extra fine finish using an abrasive disc that leaves minimal residue. Excellent for studies where surface finish is critical. Can produce 16-32 RMS finishes on common steels and 8 RMS on carbide steels. P/N Size Hole Hole Location Area Sq. In. P/N Size Thread Slot Area Sq. In. Biolab carries a variety of standard pipe plug coupon holders for flat and cylindrical specimens. We can design and make these assemblies to meet your specifications for size and material requirements. We provide conventional or custom-designed bypass systems for on-line corrosion monitoring. Commonly used in the industrial water treatment industry to determine the corrosive properties of potable or cooling water, these systems are available in PVC, carbon and stainless steels, and other materials. Bypass systems are easily installed to your existing piping. Normally, all you need is a 1” NPT male fitting on which to attach the bypass. Standard bypass systems come equipped with 4 pipe plug assemblies, 4 pre-weighed mild steel coupons, and a 5-gpm flow control valve. Packing Gland systems are used in more demanding environments, where ratings up to 1,500 psi are required and leakage is prohibited. These systems do not require line (process) shutdown to insert or withdraw coupons. The assembly is used for coupon insertion through at least a 1” full port valve. A safety chain is provided to prevent accidental ejection. These coupon holders are used with High Pressure Access Systems where pressure ratings up to 3,600 psi are required. Corrosion rates can vary between welded and non-welded metals, therefore it is advisable to study the behavior of both conditions. Studies involve examination of the parent material, the heat affected zone, the weld metal, and the interfaces between all metals involved. The surface effects produced by welding, heat-tint formation or oxidation, fluxing action of slag, and the deliquescence of slag can be important factors in the corrosion behavior of metals. Autogenous Weld Coupon 1. 120 grit standard finish unless otherwise specified. 2. 1/8” nominal thickness. 3. Standard weld is autogenous weld across end (A.W.A.E.). Sanded after weld. Stress corrosion cracking occurs when tensile stress combines with a corrosive environment to attack a material. Testing for this type of corrosion is critical in storage tanks, pressure piping, and vessels commonly used in chemical processing plants and petrochemical refineries. Biolab can make your stressed samples in accordance with all ASTM standards including G30, G38, G39, and G58 or to your custom specifications. Biolab offers test racks used to mount coupons and secure them directly to operating equipment or within a process system. Test racks make it easy to evaluate how corrosion would effect differing alloys and material finishes under identical conditions. Rack usage helps eliminate coupon loss which might occur if samples were individually placed in a process flow. Racks can be fabricated to meet your requirements for material and size. Typical racks are flat bar racks, spool racks, and pipeline insertion racks. Other racks include angle bar racks and outdoor exposure racks. A variety of insulators, washers, and spacers used to isolate coupons can also be ordered separately. Biolab makes a variety of insulators, washers, and spacers used to isolate test specimens. We also make insulator kits (R5102) that contain an assortment of washers, screws, nuts, and stems. These kits are designed for field use when a variety of insulators are needed. The chart shown here is a general guide to material applications. Call for recommendations on use in hazardous or severe environments. Biolab provides electrodes compatible with our various probes and instruments, as well as those of most other major manufacturers. Other electrodes not shown here are also available. Electrodes are made from a variety of materials (see Alloys list). Digital, hand-held, menu-driven corrosion meters that take probe measurements and store the data to be later downloaded to a computer for analysis. Data loggers used to continuously monitor probes in remote locations, automatically read the probes at selected intervals, and store the readings in memory. Field transmitters which transmit measurements to a receiver (such as a DCS or SCADA system). Wireless radio options are available to eliminate cable and conduit setup.